Many notable bridges were built by convicts in the early colonial days as roads spread out across the colony. 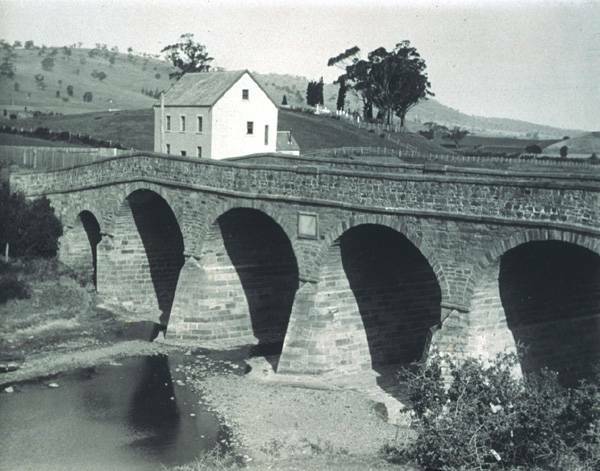 The first recorded brick bridge in Tasmania was built in 1816 over the Hobart Rivulet in Elizabeth Street. Richmond Bridge (1825) provided an all-weather route to the east coast. It is recognised as the oldest existing bridge in Australia while Ross Bridge (1833) is considered the most beautiful masonry bridge. It was designed by John Lee Archer and has extensive sandstone carvings, credited to convict Daniel Herbert. Campbell Town Bridge (1837) is Australia's oldest surviving brick arch bridge. In 1864 wrought iron trusses were imported from England to build Kings Bridge, Launceston, and a local foundry made duplicate trusses in 1904 to double the size of the bridge. From the early days of European settlement, a bridge over the Derwent at Hobart was mooted, but the first serious design was not considered until the 1930s. Designed by Allan Knight, and finished in 1943, the floating bridge was built in sections and floated into position, forming a horizontal arch which provided lateral stability against wind and water. A lifting section allowed ships to pass up-river. In 1966 it was replaced by the Tasman Bridge, designed by Maunsell & Partners, a high-level pre-stressed concrete construction with relatively steep gradients and a 310-foot main navigation span. The Tasman Bridge collapse of 1975 paralysed Hobart temporarily. A bridge over the lower reaches of the Tamar Estuary proposed in the mid-1940s was finally built by 1968. The Batman Bridge was designed by Maunsell & Partners, and is a cable-stayed truss bridge with an inclined 315-foot high A-frame tower and steel deck. Further reading: R Smith, Early Tasmanian bridges, Launceston, 1969; L Newitt, Convicts & carriageways, Hobart, 1988.